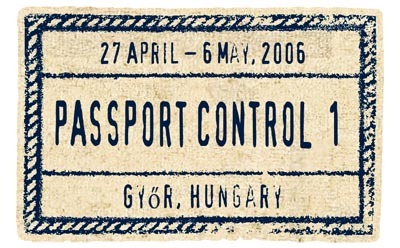 „PASSPORT CONTROL” International Film and Photo Workshop was organized in 2006 in MEDIAWAVE Festival for the first time. In the autumn, 2007 the 3rd and 4th edition of the workshop were realized in Novosibirsk with the support of "MEETINGS IN SIBERIA" International Documentary Film Festival (Passport Control 3), and then in Kars, East-Turkey within the framework of "FESTIVAL ON WHEELS" 13th Festival of European Films, Kars voltak. PASSPORT CONTROL 6th will be realized in co-operation with ETNOFEST (Subotica), mainly with Serbian and Hungarian participants. The most important aim of the programme is to let young artists from the neighbouring countries get to know each other and each other's cultures, living circumstances, and everything which can inlfuence the process of creating their works. We find this task essential because unfortunately in fact we know each other, each other's cultural background based on their history and each other's way of thinking. One of the best ways to get to know each other is co-operation with each other.